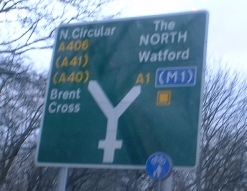 Brent Cross is a large shopping centre next to the junction with the M1 at Hendon. The shopping centre's website is here. 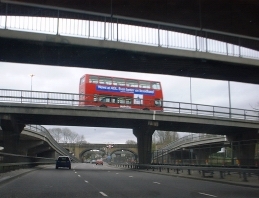 Brent Cross Underground Station is actually a long walk from the shopping centre, and is a short distance from the bridge shown. It is in zone 3 and is served by the Northern line. Henly's Corner is a crossroads in the middle of a short stretch where the A1 merges with the A406 until it branches off again 600 metres later (shown on a map here).You are likely to be stuck in traffic jams for the duration. At Henly's Corner itself, you are likely to be accosted by squeegee merchants and flower sellers, which makes it even more unpleasant for drivers. Information on proposed traffic relief plans are available here. St Pancras and Islington Cemetery (to give it its full name) was formed in 1877 and is the largest cemetery in London. 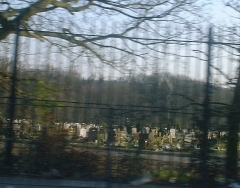 The A406 runs along its north side, and breaks in the trees give glimpses of the monuments. The junction is complicated by only one lane of traffic heading westbound up to the crossroads, so progress can be slow. On a lighter note, I believe this to be the railway bridge which for ten years carried the legend "M KHAN IS BENT" - as featured on The Mary Whitehouse Experience and described here. 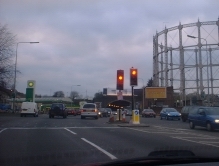 The crossroads where Green Lanes meets the A406, Clockhouse Junction is recognisable from the green and cream building on its north side. 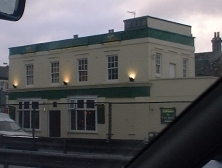 For many years, this building was known as Legends Nightclub and bore a lifesize statue of John Lennon on the roof, however it now appears to have been repurposed as a sports bar and pool venue. Most of this junction is dull, but one of the more interesting things is the graffiti on one of the bridges, visible from the westbound carriageway. It announces "I LUV U KELLY". Wonder who the lucky girl is? 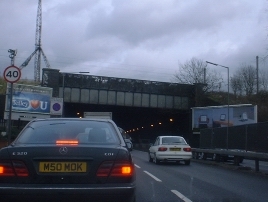 The junction is characterised by four short underpasses. Update: On 23rd March 2003 the graffiti was seen to have been amended - most of the letters had been scribbled over with black paint. 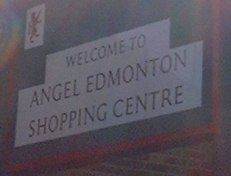 It now reads "I LU* * *****"
Angel Corner in Edmonton used to be a traffic hotspot but since the late 1990s has an underpass which has alleviated things considerably. 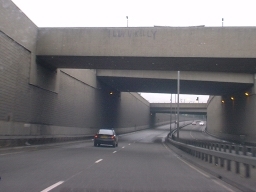 The underpass consists of a short tunnel, in which the carriageways are separated by a brick wall.